Recently, I had the opportunity to be part of the preview team for the launch of Tony Morgan’s new eBook on leadership. I highly suggest you become familiar with Tony’s ministry and resources…if you haven’t already. 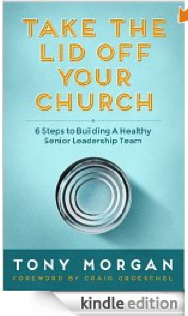 In ‘Take the Lid Off Your Church,’ Tony Morgan does an unbelievable job of packing 32 ounces of leadership caffeine into a 4 ounce gulp of practical ‘how-to’ insights for leading today’s Church. Have you ever wondered if it was possible to turn negative conflict into health? Have you ever prayed for “unwavering unity” in your staff? Tony encourages us that these, and many other positive attributes, are both possible and achievable. He addressed how to be strategic in finding and hiring church staff….as well as how/when to let them go. Of all the different leadership resources being published every year, this is hands-down one of the top must-read eBooks of the decade! One quote that really stood out to me is, “Without trust, there is no hope for a church to move forward.” This is a bold claim. Read this eBook today, then see if you agree with him. As a pastor who has experienced much negativity and unhealth in the Church, I challenge you to really implement the leadership practices and models in this eBook. If you do, I promise your ministry will not be the same. Question: If your church leadership is in need of a change somewhere (and we all usually do), do you know what it is and what to do about it?